Pyramind mentor Jor Van Der Poel shares insight on creating expressive Bass sound using various layering techniques. You can book on one time directly with Jor through the Pyramind mentorship network. Next to being an excellent all-purpose filter, Fabfilters Volcano Plugin also offers some unique extra's for Sound-Design purposes. In this video Pyramind Mentor Jor van der Poel shows how to turn Volcano into a synthesizer by using it as a ""MIDI Controlled Effect"" inside Logic Pro. Setting the plugin up in this manner enables ""Key Tracking"" which allows us to tune the filters, which basically turns them into oscillators. It's an easy and fun trick for anyone looking to get more out of this great plugin!" Ableton’s Device Racks can be a great source for new ideas and inspirations. They allow you to set up multiple “chains” which can be triggered when a certain condition is met. In this video Pyramind mentor Jor van der Poel looks into key-zones, a well known technique to divide your keyboard into multiple regions that contain unique instruments. This technique can develop a lot of different melodic ideas, especially In combination with an arpeggiator! Serum is widely known for it’s great sounding oscillators and the wavetable editor, but there’s more to discover besides that! In this video Pyramind mentor Jor van der Poel shows how to create realistic pluck sounds and beautiful pads with just a bit of noise and Serum’s excellent Comb and Flange filters. It also shows how to set up Key Tracking and how to tune your filters, recommend for anyone ready to take the next step with Serum! Unique and texture-rich sounds are often a combination of different layers. In today's video Pyramind Mentor Jor van der Poel shows how to combine different sonic colours to make new impressive bass sounds. Using a Foley Sample, a Unison Synth patch and some good old Saw Waves a completely new sounds is born, which, when re-sampled, turns into a unique patch to use for your bass-lines. It's a must watch for anyone interested in creating texture-rich, DnB-style sounds in the style of Noisia, Spor, Mefjus, Amon Tobin, etc. To this day, one of the main challenges for Sound-Designers remains making sounds that are expressive, alive and moving. 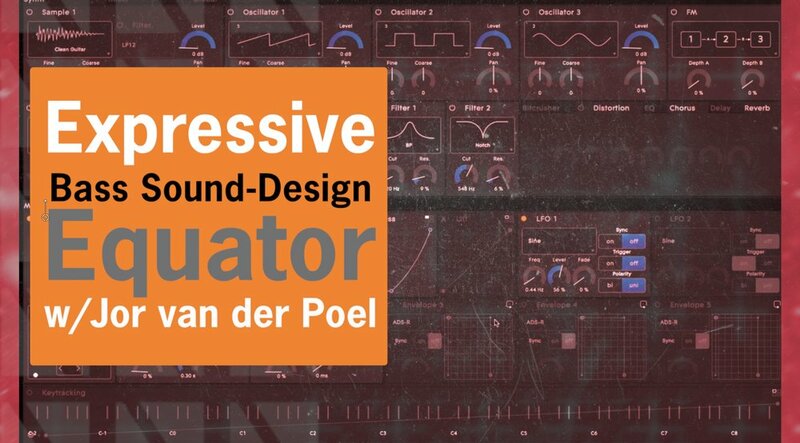 In this first part of a series on "Expressive Sound-Design" Pyramind mentor Jor van der Poel dives into creating sounds that breath, move, and feel like a real instrument, using Equator, a synth designed for the ROLI Seaboard. The unique "5D touch" of this keyboard allows to map different gestures to various synth parameters, which, in this example, makes for some truly dramatic bass sound. Submit Your Email to Unlock More Cool Sound Design Videos! Book Your Mentorship Session with Jor Now!